Started in the 1960s and named after its founder, Russ Berrie and Company released tons of toys over the years, including plush animals, troll dolls, holiday gifts and various novelties. One of its brands, just called "Russ," produced some really awesome and fun little toys in the late-1980s through the mid-1990s. For example, I can remember seeing their monster and holiday-themed rubber finger puppets all over back then, and still have several of them in my collection. In this post I'm featuring another standout Russ release -- this great set of small rubber dinosaurs! I say "dinosaurs," but the Russ people really pushed the theme here beyond regular old historically-accurate dinosaurs. Instead, they're more like dinosaurs combined with fantasy monsters or kaiju. There's even a winged dragon thrown into the mix for some reason. Compared to the droves of other dinosaur mini figures released over the years, it really makes this set stand out. 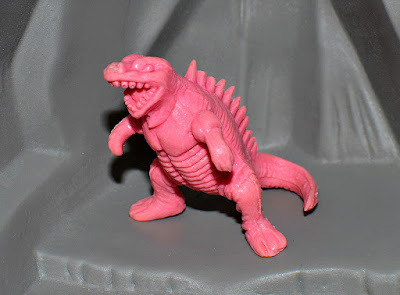 It also helps that the sculpts are well done, that they're made of a nice Monster in My Pocket-like rubber and that they come in a variety of bright, attractive colors. While I got some of these new in stores as a kid, I can't remember if they had a specific name or if they were just called something generic like "Dinosaurs." I believe they were sold individually from a box or tub that would have been sitting on the counter in gift, toy and novelty stores. I'd love to eventually find a photo of one of the containers. I'm fairly sure they came out sometime between 1990 and 1995, but I can't say a specific year. Each figure has the Russ logo on its underside, in addition to "Hong Kong." See the photo to the right for an example. There are seven different sculpts I'm aware of, although I'm not positive that there weren't more than that. That's just all I own or have ever seen in my searches. They range from 1 to 2 inches tall, with the creatures that stand upright being the tallest. 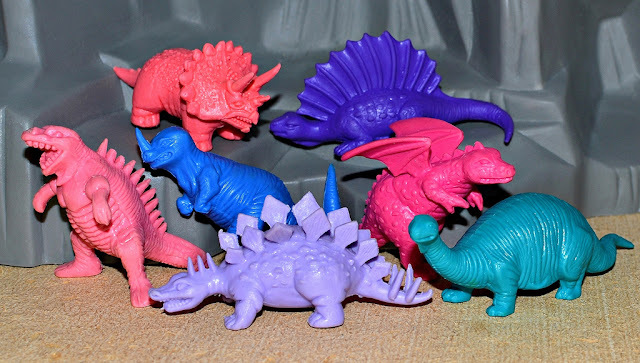 Some of the sculpts seem to have been released only in lighter colors (light purple, light blue, pink, aqua), while other dinosaurs can be found in deeper shades (darker purple, darker blue, magenta). Perhaps this means there were two different sets released at different times--I'm not sure. 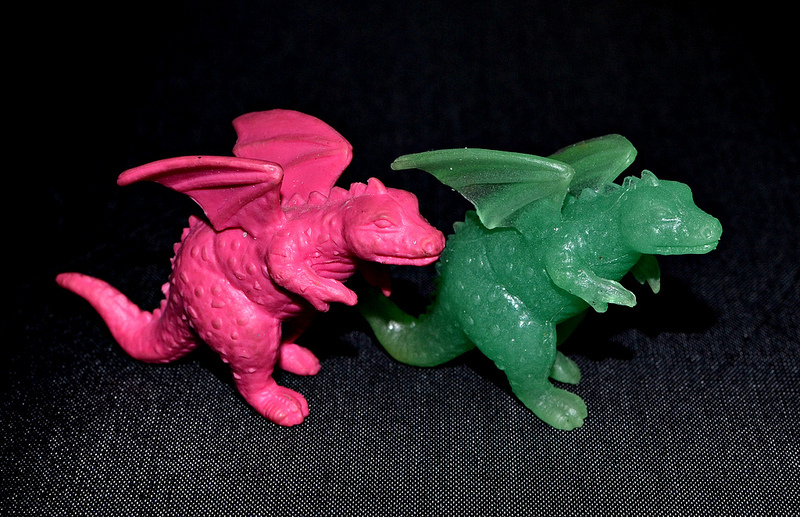 I also own one of the figures (the winged dragon) in glow-in-the-dark translucent green, which I got as a kid. I can't remember ever seeing another glow-in-the-dark example in my online searches. It's just a guess, but maybe glow-in-the-dark versions of these figures came out later, following the standard color releases. 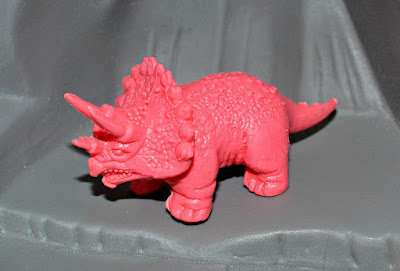 This stubby, brutish Triceratops just might be my favorite. The bumpy texture that was sculpted onto this figure is fantastic, and I love how its face looks so gnarly! What stands out about this Brontosaurus (or whatever they're called these days) is how chunky it is compared to the other figures. It's a nice solid, thick hunk of rubber. A winged dragon in a set of dinosaurs? Hey, why the hell not. 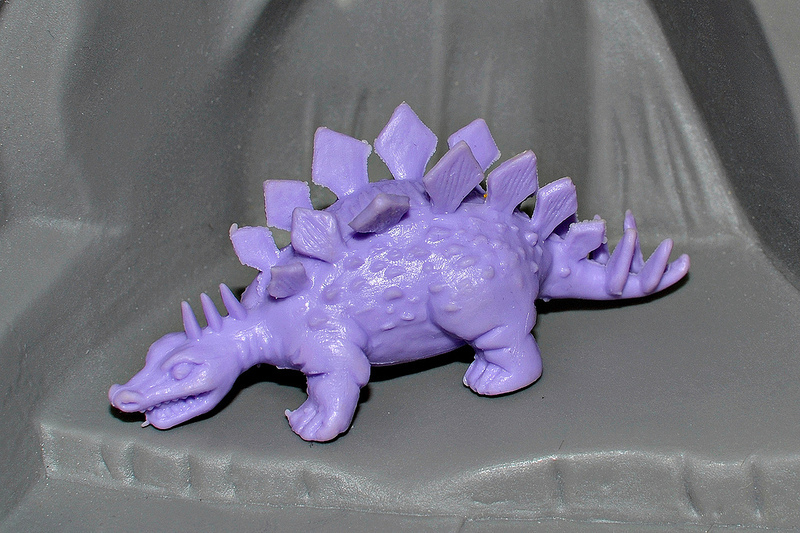 Like the Triceratops, this Stegosaurus also looks a lot fiercer than in most other toy depictions. Again, there's the dino-meets-kaiju thing going on. 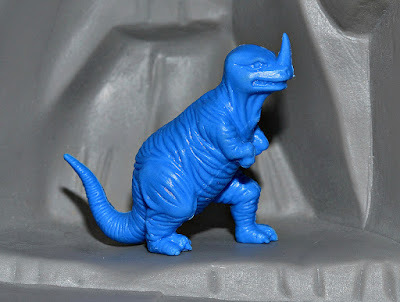 I don't know what dinosaur this is supposed to be, but considering the other figures in the set, maybe it's not even based on an actual dinosaur. Unicornosaurus? Here's another favorite. I think it's somewhat T-Rex inspired, but it's also Godzilla-like. Finally, we have what I guess is a Dimetrodon. It's funny, because usually this one looks more docile, so it's sort of like they went the opposite route than with most of the other sculpts. And there you have it! More excellent, colorful hunks of rubber from days gone by. Who else remembers these things? And who can shed any more light on exactly how they were released? There are all such lovely little creatures, I cannot wait to bite into one. I think the "Unicornosaurus" is meant to be based on Iguanadon -- how they were originally thought to look and are still depicted at London's Crystal Palace. Ah, maybe so - thanks! 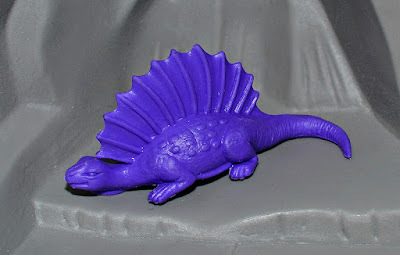 As a kid, I thought it was a Ceratosaurus. 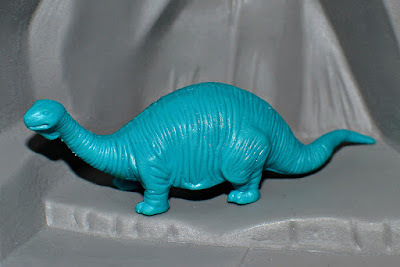 It's the only carnivorous dinosaur I know of that had a horn on its nose (albeit not a huge pointy one). I only had four of these. I think I got them at a Six Flags in Texas, sometime in the '90s. 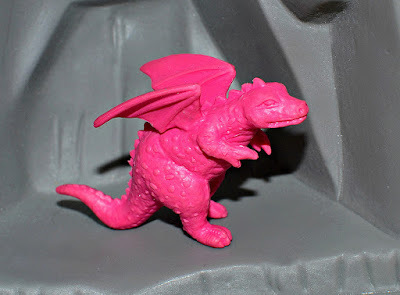 I remember looking through the bins to see if there were any more different ones because I could only find one of the winged dragon. Happy to see what at least some of the others looked like. Great post. Those are neet figures. I see why you can't really call them dinosaurs. You can't just call them Chinasaurs either because you actually know who made them. Russosaurs? I've been looking on the internet for Russ tombstone demon erasers, but can't find any :| I had 2 or 3 in the early 90's, they had them in orange and purple and had cat-like eyes peering over a grey "RIP" tombstone. 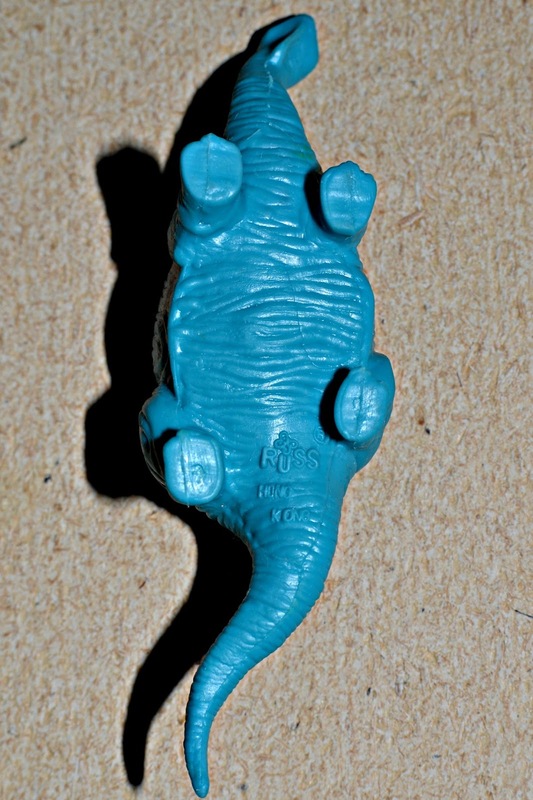 Regarding dinosaur erasers, I have lots of them (including 80s dinosaur erasers), but no Russ ones.